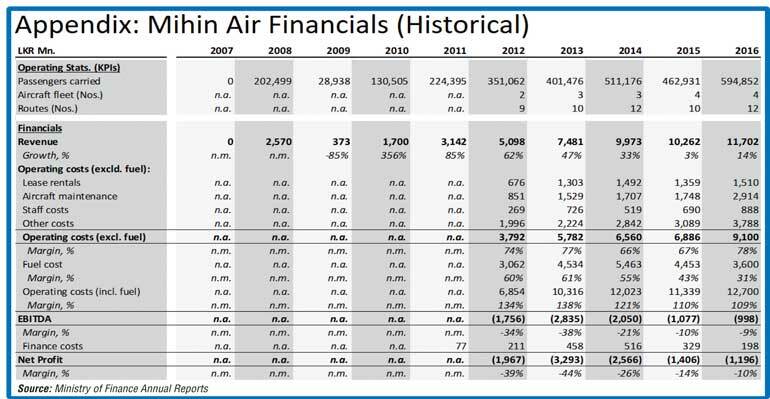 An analysis of the historical performance of Mihin Air shows a very healthy growing young company with impressive growth trajectories. Passengers Carried was growing at a CAGR of 14% from inception in 2007. CAGR or Compounded Annual Growth Rate shows the average annual growth rate over a defined period. The passenger numbers grew from around 200,000 in 2008 to around 600,000 in 2016, at a healthy average rate of around 14% every year. Revenues were growing at an impressive CAGR of over 23% over the last five years (from 2012 – 2016), with almost Rs. 12 billion in Revenue in 2016. In comparison SriLankan Airlines was only growing at 2% over the same period. The Operating Cost as a percentage of Revenue (OpEx Margin), excluding fuel cost, was well below 80% and reducing further, showing good operating discipline. The EBITDA and Net Profit were showing signs of remarkable progress to profitability, and indicated potential profitability in 2019. For a start-up Low Cost Carrier (LCC) or Budget Carrier, it showed signs of a “Superstar” and had phenomenal potential, as indicated by the financial performance. There was absolutely nothing to justify the “Assassination” of this healthy young growing company. So why did they “kill” it? Was it just envy or was there something more sinister? Mihin Air was started in 2007 as a defence mechanism and had a well-planned strategic rational. Since then a number of flag carriers have started their own sister budget carries to defend against the threat from mushrooming LCCs (Low Cost Carriers). Just like the Great Wall of China, to the public it may seem like an irrational and a financial burden at the start, but eventually it is what will protect the mother ship from the invaders. If the next ruler came and took down the Great Wall without understanding why it was built in the first place; then it may have ended up as a sad tragedy. The book titled ‘The Art of War’ was said to be written by an ancient Chinese Military Strategist Sun Tzu, who lived in the 5th century BC. The book (now used in top MBA programmes around the world) talks mainly about war strategy, but the techniques described are interchangeable and can be applied in many other fields, including politics, sports and business. The success of the ruthless terrorist organisation the LTTE was mainly down to their “Guerrilla” strategy. A similar strategy can be seen in the LCCs of today, whether in Europe or in Asia. Therefore, an answer to defeating the LCCs of today can be derived from observing the solution that was utilised and applied effectively by the then Defence Secretary Gotabaya Rajapaksa. He used a Special Forces Commando unit which was known as the LRRP (Long Range Reconnaissance Patrol) or as the enemy would later refer to it, as the Devil’s Brigade (Mahasohona Balakaya), and used it to fight using the same “Guerrilla” techniques as the enemy. The strategy was highly effective, and the unit contributed immensely to the successful conclusion of the civil war. Coincidentally the same Defence Secretary was said to be a Director at Mihin Air and was instrumental in starting the budget carrier. 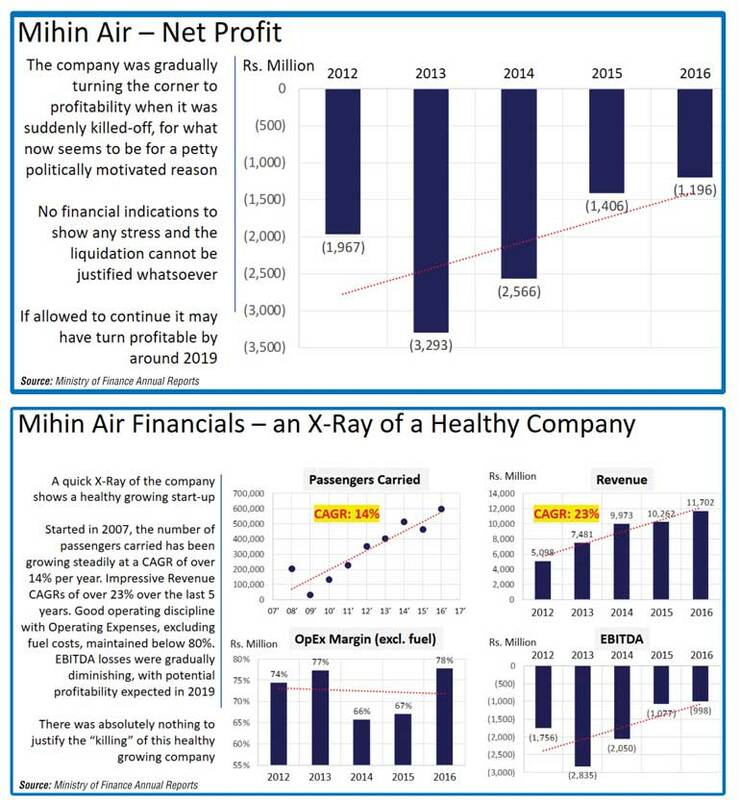 No sooner the news of the death of Mihin Air was publicised at the end of last year, we have seen a number of aggressive budget carriers looking to enter the Sri Lankan market organically and in-organically. For flag carriers the LCCs are considered as “terrorists” in the sky. They will use guerrilla tactics and terrorise the market by dumping capacity (seats) and yield (prices) and eventually draining significant Revenue away from flag carriers. The recent Cabinet paper put forward by two powerful senior ministers with a proposal to allow one of the largest Malaysian budget carriers to set-up a hub in Sri Lanka is as ironic as opening your defences for a Trojan horse. The offer of a 51% stake in the new company is a “bait” and the promise to add value to the Sri Lankan tourism industry is a “joke”. If approved, SriLankan Airlines will have a quick death with significant financial consequences to the State Treasury. The ministers must not be blinded by the illusion of the profit sharing proposed, but study the significant damage impact to the financial position of our flag carrier. Unfortunately, the damage done to the flag carrier’s defences with the elimination of Mihin Air is irrecoverable and we will pay a heavy price for it. Some even calling it another Millennium City incident.